Enjoy the personalized haircut services and styling performed by our experienced master stylist who will give her undivided attention throuought the session and make you fully aware of available options before the procedure while taking into account your own particular style and hair habits. Being an eco-friendly establishment we use only certified organic components offered by Organic Color Systems company and made with the best natural and certified organic ingredients. They are 100% FREE of Ammonia and other potentially harmful chemicals often found in regular hair products. We did not forget about kids too! 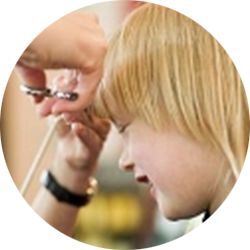 Bring in your precious little ones for a meticulous haircut in a kids-friendly environment.